New blog! Welcome to Donalynn Miller, who writes The Book Whisperer for Teacher Magazine. The 6th grade teacher from Texas is the author of the series "Creating Readers," which ran at the magazine earlier this year. What's your tribe? Authors offer opinions on "brown books" and the multicultural label, at the blogs Finding Wonderland and Mitali Perkins' Fire Escape. By the way, I hope you read A. Fortis's interview of Sherman Alexie (source of the "tribes" reference) at Finding Wonderland; it's a gem. Nominations for the Children's and YA Bloggers' Literary Awards (the Cybils) close today. Go forth and nominate. Karen MacPherson lists books for reluctant readers (apparently middle-school boys, to judge by her choices) at the Pittsburgh Post-Gazette. Don't miss the first round of bidding at Robert's Snow, the online charity art auction at the Dana-Farber Cancer Institute. Joan Waites is the artist of the day here at Chicken Spaghetti. 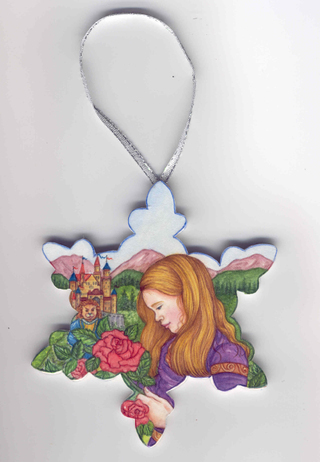 Her beautiful snowflake, "Beauty and the Beast," highlights my final installment of Blogging for a Cure, in which many children's book bloggers feature the unique art pieces from Robert's Snow for Cancer's Cure. That online charity auction raises money for cancer research at the Dana-Farber Cancer Institute; please go to the Robert's Snow web site for details on how to bid. Joan's "Beauty and the Beast" is part of the first group of snowflakes to be auctioned; bidding starts Monday. Joan is the illustrator of nearly 40 books for the educational and trade markets, as well as several children's magazines, posters, and greeting card art. Illustrated works have won the following awards: IRA/CBC Children's Choice Award; IRA/NCSS Notable Social Studies Trade Book, and a Benjamin Franklin Award. The artist is also an adjunct faculty member of the Corcoran Museum School of Art and Design in Washington, D.C., where she teaches various children’s programs in drawing, painting, sculpture, and story book illustration. The artist works from her home studio in the metro Washington, D.C., area, where she lives with her husband, three children, two cats, and one rambunctious puppy. Joan was kind enough to answer some interview questions; if you're an artist just beginning your career, she offers some good advice. How did you become involved with Robert's Snow? I became involved in the first Robert's Snow auction after hearing about a call for illustrators to contribute snowflakes from Grace Lin. My father had just recently passed away from esophageal cancer, and my mother was undergoing treatment for breast cancer at the time as well. It seemed like a small way that I could help contribute to cancer research. Where did you get the idea for your snowflake? I wanted to use a fairy tale as inspiration this year, one of my favorite types of stories to illustrate. "Beauty and the Beast" seemed appropriate...the "Beauty" of a cure overtaking the "Beast" of cancer. Do you have any advice for children's book illustrators just starting out? I'd say the best thing to do first is really familiarize yourself with the market. Read and study hundreds of published books in the library or bookstores. Look at how the art enhances and plays off the text. See how your own art compares and fits in. Develop a strong portfolio showing your ability to draw children and animals, and carry those characters through several scenes, like you would in a book. Re-illustrate your favorite fairy fale or fable to get a sense of what it's like to work with text and illustration combined. Develop a postcard mailer, and a simple web site/blog if you can. Get a copy of the latest Children's Writer's and Illustrator's Market to research publishers and their needs. Join the Society of Children's Book Writers & Illustrators, study its web site and articles, and attend a regional conference to learn about the business and network with other authors and illustrators. Lastly, have a lot of patience and perserverence. It may take several years to get your career off the ground, but it's worth it...I can't think of a better job! Which books on your bookshelf do you refer to over and over again? I can't say I have one book in particular that I go back to, but at the start of a new job I often look over my collection of books from other illustrators to spark an idea or color palate. Some of my favorite children's books are the ones illustrated by other watercolor artists such as Jerry Pinkney, Charles Santore, David Wiesner, and Jane Dyer...all of whom have also contributed snowflakes to one of the three Robert's Snow auctions! [Here is] a sample piece of art for a book I have written and illustrated called Sophie's Seasons, which I am just starting to submit to publishers. It's the first book I have both written and illustrated, so my fingers are crossed! Good luck to you, Joan, and thank you so much for participating in Robert's Snow. Readers, click over to the Robert's Snow site, buy a snowflake, and raise money for cancer research! Snowflakes by Marion Eldridge and Maggie Swanson, artists whose work also brightened up this blog, are part of that first group, too. Robert's Snow for Cancer's Cure is an online charity auction of some 200 snowflake art pieces created by children's book illustrators. The proceeds from the auction go to cancer research at Boston's Dana-Farber Cancer Institute. Won't you put in a bid? They make excellent, one-of-a-kind gifts. Visit the Robert's Snow/DFCI web site to see the particulars about buying the snowflakes. The bidding starts next week. Maggie Swanson's snowflake, "The Birdfeeder," goes up for auction starting Monday, November 19th. This piece of art makes me happy just to look at it, and I am honored to feature Maggie's work here at Chicken Spaghetti. Maggie Swanson wanted to be an artist for as long as she can remember. As a child growing up in New Haven, Connecticut, she spent many hours in her parent’s grocery store drawing and coloring pictures with the customers. After graduation from the Rhode Island School of Design, she spent three years illustrating and designing product for Hallmark Cards in Kansas City. Returning to Connecticut, she started her family and her freelance career. Since then, Maggie has illustrated more than 100 books for many different publishers. At Maggie Swanson's web site, you'll see that she has illustrated many "Sesame Street" titles. Time for Bed, Elmo is one of our favorites. Don't miss the photographs that she takes at a local animal shelter, too. Beautiful. "I have two new books for Christmas. 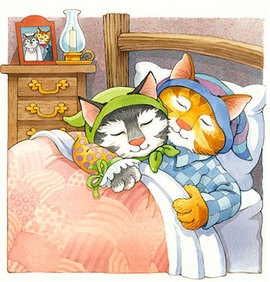 One is The Kitten's Christmas Lullaby, which I wrote and illustrated for Regina Press. This one has an interesting back story relating to my work at Paws. The book is based on an Italian folk tale that I read on a bulletin board at the shelter. It was a torn off page from a 'Cat of the Day' calendar. I couldn't stop thinking about it. I don't normally write, but this book was so clear in my mind that I figured out the words and layouts in only a few hours. The other is A Scratch & Sniff Night Before Christmas, published by Sterling Publishing Company." Maggie sent along these images from A Scratch & Sniff Christmas (below, left) and The Kitten's Christmas Lullaby (below, right). Aren't they wonderful! Many thanks to Maggie for sharing the illustrations with us. Don't forget to bid on "The Birdfeeder" at Robert's Snow. The final week of Blogging for a Cure starts today. Blogging for a Cure supports Robert's Snow for Cancer's Cure, the online charity auction of wooden snowflake ornaments decorated by children's book illustrators. Proceeds go to the Dana-Farber Cancer Institute, and the effort by the children's book bloggers was launched to drive as much traffic as possible to the Robert's Snow web site. There you'll find all the information about how to bid on these unique pieces of art. The first round of auctions begins Monday, November 19th. Buying a snowflake will fund cancer research. That's what it's all about. Do stop by these woods on a snowy evening for a visit with artists Maggie Swanson on Wednesday and Joan Waites on Saturday. This week's schedule and the source of this post's title come after the jump. Following all the Robert's Snow posts in the blogosphere has become a great way to learn more about illustration and the way artists work. To explain a bit for those new to the endeavor, Robert's Snow is an online charity auction to raise funds for the Dana-Farber Cancer Institute. 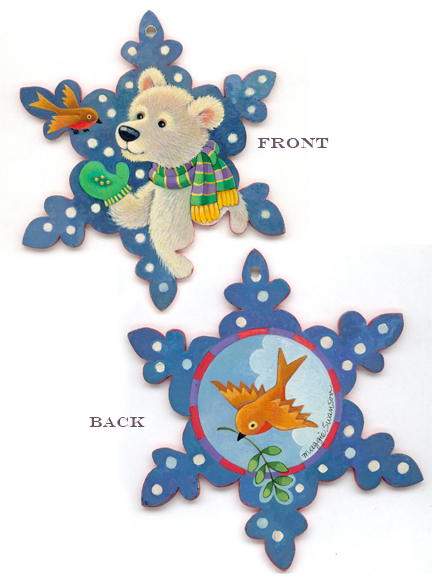 More than 200 children's book illustrators have decorated wooden snowflakes that are being auctioned off. In support, a number of children's book blogs are featuring individual artists involved in the project. Masterminded by the indefatigable Julie Danielson at Seven Impossible Things Before Breakfast, Blogging for a Cure started in mid-October, and continues for the next several weeks. To see all the snowflakes in one place and to find out how to bid, visit the official site of Robert's Snow for Cancer's Cure. This week's schedule of blog features follows after the jump. Many thanks to Tricia at The Miss Rumphius Effect and Jen of Jen Robinson's Book Page for providing the links. Robert's Snow is an online charity auction to raise funds for the Dana-Farber Cancer Institute. More than 200 children's book illustrators have decorated wooden snowflakes that are being auctioned off. In support of the endeavor, a number of children's book blogs are featuring individual artists involved in the Robert's Snow project. Blogging for a Cure started in mid-October, and continues for the next several weeks. To see all the snowflakes in one place and to find out how to bid, visit the official site of Robert's Snow for Cancer's Cure. This week's schedule of blog features follows after the jump. Robert's Snow for Cancer's Cure is an online charity auction of some 200 snowflake art pieces created by children's book illustrators. The proceeds from the auction go to cancer research at Boston's Dana-Farber Cancer Institute. Won't you put in a bid? They make excellent, one-of-a-kind gifts. Visit the Robert's Snow/DFCI web site to see the particulars about buying the snowflakes. Marion Eldridge's snowflake, Shanté Keys (left), goes up for auction starting Monday, Nov. 19th. I am so pleased to feature it here at Chicken Spaghetti as part of the Blogging for a Cure initiative. 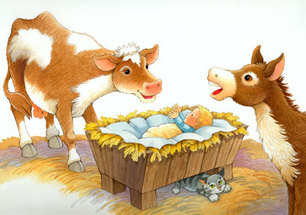 Marion Eldridge has illustrated over 40 books for children. She has worked for both trade and educational publishers. She has a daughter, Kate. Marion lives in Massachusetts with her husband, Paul, and their little dog, Tam-O-Shanter, who keeps Marion company while she is working. 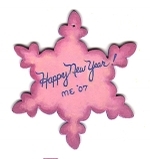 In addition to adorning a snowflake, Shanté Keys stars in Shanté Keys and the New Year's Peas (Albert Whitman & Company, 2007), which Marion Eldridge illustrated and Gail Piernas-Davenport wrote. Their joyful picture book celebrates family, community, and diversity. It imparts a few facts about New Year's customs in different cultures as Shanté goes from neighbor to neighbor looking for a missing ingredient for her family's feast. (Eating black-eyed peas for good luck on New Year's Day is an African American and Southern U.S. tradition.) Marion and I chatted via email recently. 1. What were some of your favorite childhood books? I loved The Golden Egg Book by Margaret Wise Brown, illustrated by Leonard Weisgard. I still have a copy, though not the one I had as a kid. I've remembered it vividly my whole life. My parents did save some pop-up books that were mine when I was little. One is called Playtime in Action. Another is Christmas Time in Action. They are quite elaborate pop-ups of whole scenes. Very impressive! Both were illustrated by William Kemp Tilley, with a copyright by Walter P. Phillips. I'm so glad my parents saved these for me! They are a lot of fun and bring back many warm memories. They are quite a contrast to the books that kids have now! 2. 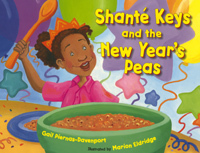 Children are going to love Shanté Keys and the New Year's Peas. With its bouncy, rhyming text, the book is such fun to read aloud. I can imagine a kindergarten class chanting along. Shanté herself is adorable and looks someone you'd want to be your friend. Did you use a model or have someone in mind when you created the illustrations of the little girl Shanté? I love the bouncy, rhyming text too! And I'm so glad if you'd like Shanté to be your friend! I feel the same way. I would miss her and the other characters in the book, but they share my studio now. It's great having them around! I didn't use any models or reference photos for Shanté or the other characters. They came completely from my imagination—with inspiration, of course, from the text. For me, creating the characters is one of the most fun parts of illustrating a story. In general, I just try to observe people a lot and occasionally browse through photographs online to get ideas, but then I put it all aside and just draw. 3. Here's an image from the book. Would you tell us about this picture? What's going on at this point in the story? "I'm weak in the knees. It's a dramatic scene—everyone shocked and surprised! But, I tried to soften the blow a little for Grandma by putting Shanté's Dad's arm behind her as though he is offering support. 4. Are there going to be further adventures of Shanté Keys? She's a natural for a series. There are no plans that I know of. Of course, that is up to the author, but I would love it! For now, Shanté is participating in Robert's Snow for Cancer's Cure. Gail had some wonderful things to say when she found out that Shanté was involved in Robert's Snow. You can read about her reaction on her blog, Writing from the Lemonade Stand. I just loved what she had to say! Thank you, Marion. Readers, don't forget to click over to the Robert's Snow site and bid in November! Featured at other blogs today are snowflakes by Carin Berger, at Chasing Ray; Sophie Blackall, at not your mother’s bookclub; Erik Brooks, at Bildungsroman; and Brian Lies, at Greetings from Nowhere. The blizzard of festive snowflake art continues. 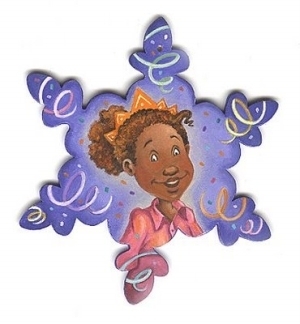 Through November various blogs will be featuring individual children's book illustrators' snowflakes from the Robert's Snow: for Cancer's Cure online auction. The snowflakes themselves are a bit more than 5 inches big. Proceeds go to funding cancer research at the Dana-Farber Cancer Institute in Boston. The first round of bidding starts in November; see the Robert's Snow web site for complete details. Grab a pencil and paper, and be prepared to make a wish list! On Tuesday, artist Marion Eldridge visits Chicken Spaghetti as part of the Blogging for a Cure effort, so stay tuned. THE REST OF THIS WEEK'S SCHEDULE IS AFTER THE JUMP.